“Shaman’s Eye is a fantastic book. Shaman’s Eye, Beth Beurkens’ first collection of poetry, takes us on an ancient and contemporary spirit journey to be initiated into the luminous wisdom of the heart. Like sacred stories, these poems move us through haunting, mystical realms, revealing the cosmic design of human life. Beurkens speaks with deep intuition and keen vision about our connections to the spiritroot, the natural world and to the life-thread itself. These brilliant, beautiful poems and their companion petroglyph photographs open a rapturous portal to our unity with Source. Beth Beurkens is a searching and singing spirit, drawing wisdom from the natural world. In Shaman’s Eye, Beth Beurkens speaks with deep intuition and keen vision about the connection to the spirit-life, to the natural world, and to the life-thread itself. These are brilliant, beautiful poems, each a portal to a world as intimate and sacred as a dream. Beth Beurkens turns words until the reader feels the freshening of the soul. The images are crisp and soothing, and I became the knower and the known. These poems provide us a stepping stone in the path to the future. BETH BEURKENS, M.A. is a poet, non-fiction and travel writer. She is the author of a book on dream interpretation, By the Light of Our Dreams, and has been published in numerous anthologies and news magazines including We’Moon, In Celebration of the Muse, and Mountain Spirit News. Beth teaches college-level creative writing and is a poet-teacher for California Poets in the Schools. 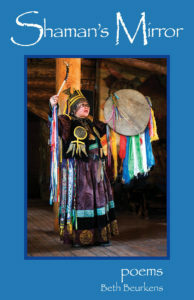 She is on the faculty of The Foundation for Shamanic Studies, teaching shamanism in California, Nevada, and Oregon. She also teaches in Europe and has a private shamanic healing practice in Ashland, OR and Switzerland. She is a calendar editor with Amber Lotus Publishing and teaches writing at Rogue Community College. In her innovative writing programs, she helps writers unleash their courage and creative genius. She holds a Master of Arts degree from the University of California, Santa Barbara. Her deepest learning has always been from the voices of the stars, lakes, sun, trees, stones, moon and the helping spirits who, she says, are always singing to us. To order by mail, fill out the order form below and send with a check or money order to Beth Beurkens, P.O. Box 483, Ashland, OR 97520. All copies signed by the author. $7.00 for first book, $1.00 for each additional book. For International orders contact the author. Poems are images that give us a window into the life of the soul. Spirit sings. Poetry translates that breath of infinite love and healing to us, illuminates the spirit in us and in our relationship with the world. Poetry especially carries the power of healing and radiance in it, what shamans call “word doctoring.” The rhyme, cadence, rhythm and words can carry us to other worlds where new images, new connections and illumination await us. 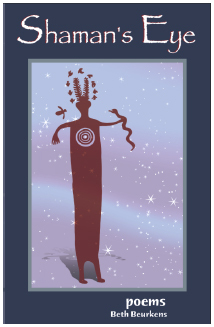 As poets we are “priests of the invisible,” diviners, word doctors, and shaman mystics. We give shape to the ineffable. A book is a living being that miraculously finds its way into the hands and hearts of others. Sky Ladder Press was founded to provide quality books that help people discover their relationship to the spiritual and natural worlds, and that give voice to the worlds of the invisible.